Brass members of the Philharmonic, Patricia O’Connell, Joseph Spena and Nathan Raboy, recently presented a brass trio concert of patriotic music to students at three Binghamton Elementary Schools. The selections highlighted an American historical timeline from the Revolutionary War through WWII. The students at Benjamin Franklin, Theodore Roosevelt and Woodrow Wilson schools clapped and marched to the music and learned the history behind some of America’s patriotic music. 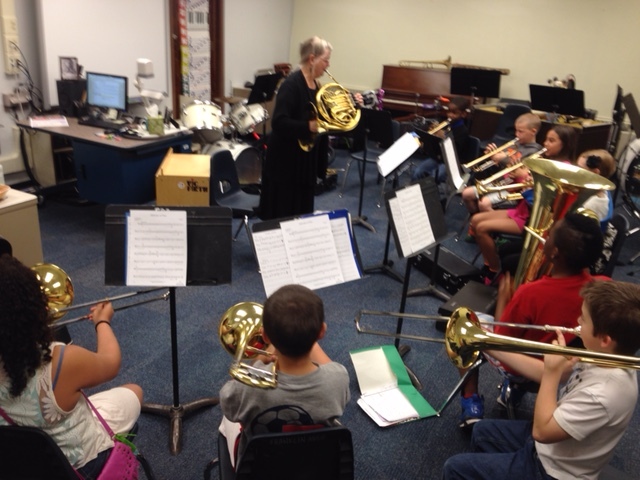 In addition, each musician coached the brass students at one school for three Friday mornings in May. This program was put together by Colin Bunnell and Susan Pierce and generously sponsored by an anonymous donor and the Binghamton Philharmonic Orchestra. Trio gets the kids clapping along to a patriotic tune!